In Greece watermelon is included in almost all courses when it is in peak season, particularly in desserts. 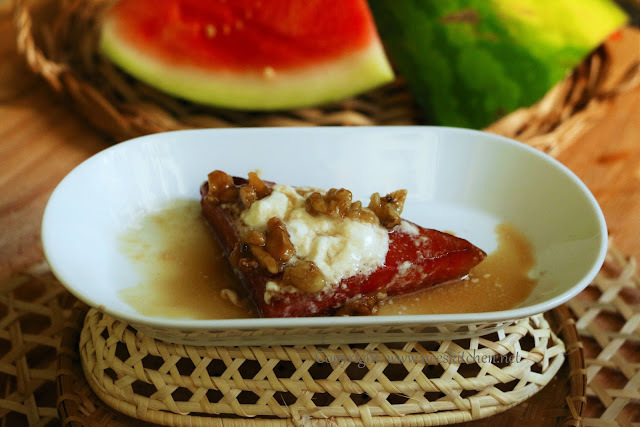 Fried watermelon is one such dessert which can be commonly found in Greece. 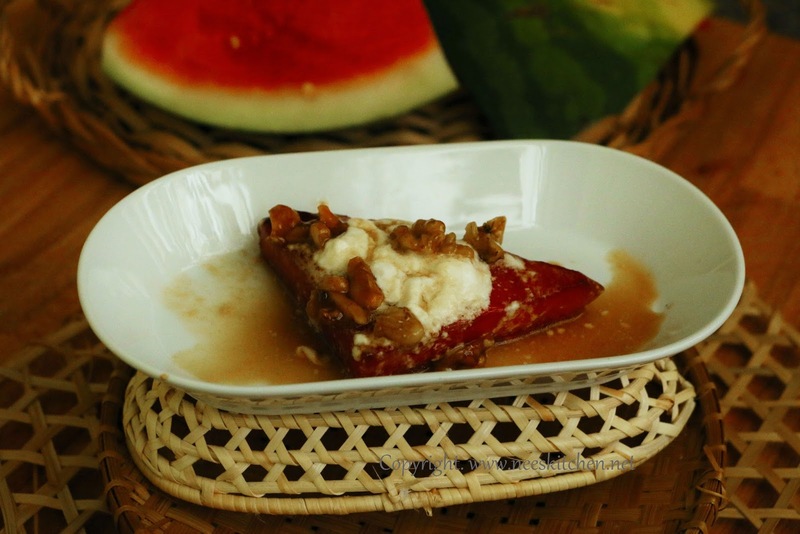 Watermelon fried in olive oil and garnished with yogurt and honey caramelized walnuts gives this refreshing dish. The climate here is very much fluctuating and during the hot days we feel like having watermelon the whole day. We had some guests few days back and I prepared this dessert for the dinner. It became a super hit though the only constraint for this dessert is, it must be prepared and served on the fly. It is ideal for limited number of guests, say one family. If it is a big count then you will land up staying in the kitchen. The caramelization of walnuts needs to be prepared in advance. The dessert is quite refreshing and perfect to end any meal. Make sure to select a watermelon variety which is very sweet. The yogurt should not be sour. If you want to make it a desi version you may try frying them in ghee. It gives a different taste. Dusting with icing sugar is completely optional. I felt with and without icing sugar both to be good. 1. Take a non-stick pan, add butter. 2. Once butter is melted add honey. Mix them well. 3. Add walnuts and stir until they are coated well. 4. Once its coated, continue to cook for 1 minute so that they turn into golden brown. 5. Take a baking tray or any cooking tray and line it with baking paper. 6. Add the honey cooked walnuts into this. 7. Let this cool off and gets into a state where you can break them into pieces. It took me around 30 minutes for this process. 8. Caramelized walnuts in honey is ready .You can store them in an airtight container and use them just before serving the dessert or for future. 9. For the actual dessert, cut the watermelon and remove the rind. The size of the cut piece must be 4 cm thick triangle or square shape. 10. Dust the watermelon with icing sugar. This step is optional if your watermelon is too sweet. I have ignored for this post. 11. Just before serving, take a pan and add 1 tsp olive oil and place the water melon. 12. Make sure to fry it in all the sides by flipping it. 13. Place the watermelon in the plate and add yogurt. 14. Garnish generously with caramelized walnuts and serve them immediately. 15. Repeat this for the remaining pieces. If you are reusing the same pan which you used for caramelizing walnuts, remove the honey pieces which if anything is there.